In September 2016, Roosevelt University hosted its inaugural American Dream Reconsidered Conference. 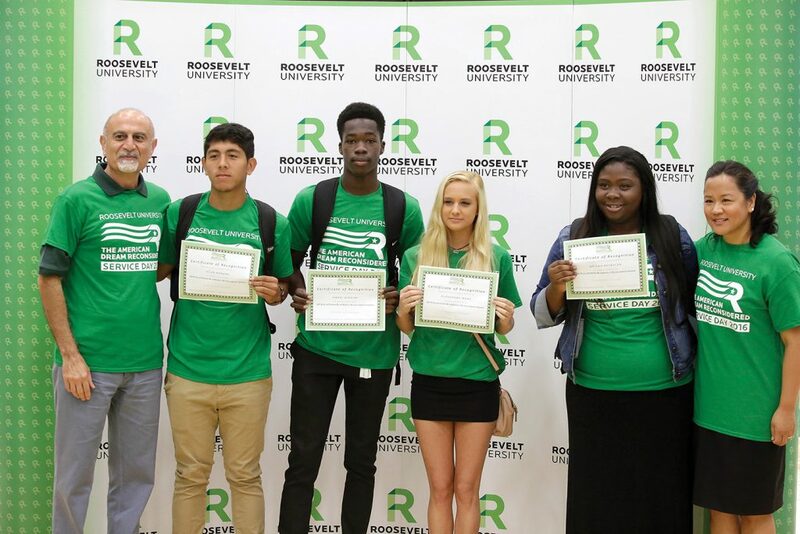 In celebration of the event and to assist Roosevelt students, BlueCross BlueShield of Illinois, a title sponsor of the conference, generously established the American Dream Scholarship program to support six Roosevelt University freshmen. Each of these scholars is the first in their family to attend college. All of them view the American Dream as an inherent promise of opportunity for their own personal goals and for the nation’s success. The following provides insights as to why each chose Roosevelt and what the American Dream means to them. Halie Reyes is from Des Plaines, Ill. and attended Maine West High School. Her goal is to be a teacher. “I was inspired by so many teachers in my life and I want to have the same influence,” she said. Roosevelt appealed to her because “it has a strong focus on social justice. It allows me to stay involved with service and have a healthy environment.” The American Dream for Reyes “is the drive to achieve more without folding due to obstacles.” She refuses to allow financial issues to be a barrier to her success. “I am motivated to keep moving forward,” she said.